I am wondering what the Japanese called them? Last edited by Akira Takizawa on 04 Aug 2006 08:33, edited 2 times in total. チャハル = Chahar? Maneuvers or Operation? Chinese Capital (Rail)line Maneuvers or Operation? Tsu Inlet (Rail)line Maneuvers or Operation? What does the Tsu Inlet refer to? 浦 = 浦口, Pukow or Pukou, a small town near Nanking, across Yangtze River. There were no bridges on Yangtze River so Pukou was the termination of the railway which links Peking and Shanghai at that time. Trains must across Yangtze River by ferries. Last edited by Windward on 04 Aug 2006 08:08, edited 1 time in total. you can find Peking, Tientsin (Tien-chin), Pukow (P'u-k'ou), Nanking and Shanghai on this map. Last edited by Windward on 06 Aug 2006 05:30, edited 1 time in total. 太源作戦 is my mistake. 太原作戦 is correct. Taki and Windward, thanks. That helps. Was the Japanese intention for this Operation to end up in Hankow holding the line all the way back to Peiking? So for the Japanese and/or Chinese was this battle is actually considered to end after the fall of Hsuchou in late May of 1938 linked up the railline to Pukow? Any of the battles in 1938 (Taierzhang March - April 1938, Linyi March - April 1938, Hsuchow May-June 1938) being sub battles within the campaign? Date of the campaign should be Early August 1937 to June 1938? I cannot understand why they are called Battle of Wuhan or Battle of Süchow in China. They were not fought there and they were not even objects for operations. 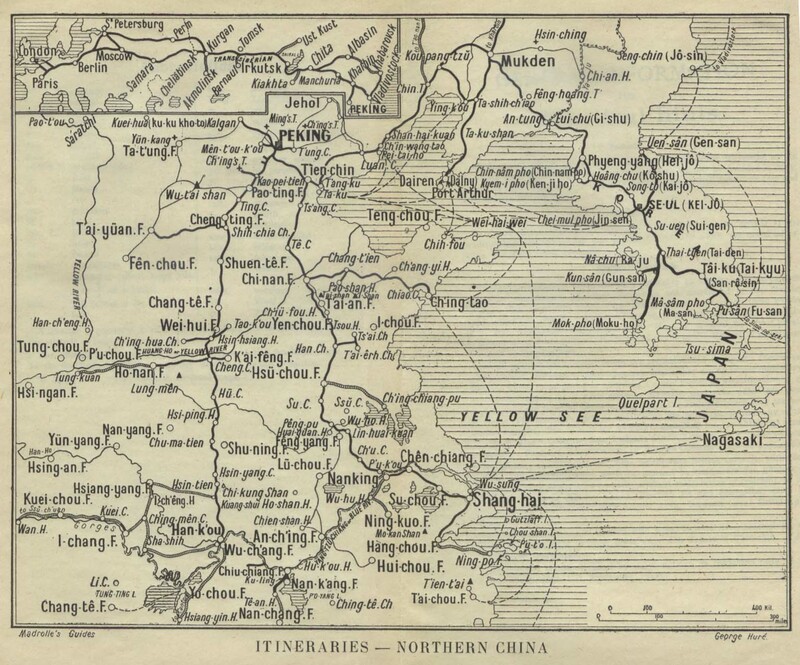 Was the original plan to stop on the line of the Yellow River and hold north China alone? Then when the Shanghai Nanjing situation failed to get China to give in that December of 1937 the Japanese decided to push on to the south? Was the original plan to stop on the line of the Yellow River and hold north China alone? Original plan is to fight the Chinese on the line between Baoding and Duliu (20 km south of Tientsin). But, the Chinese withdrew without fight and the Japanese went south pursuing them. The GHQ at Tokyo ordered the North-China Expeditionary Army to stop. But, generals of the North-China Expeditionary Army ignored Tokyo and continued to advance. At last, they stopped at Zhangde and Jinan, because the reinforcement to the Battle of Taiyuan became necessary. 2 Plans for North China? Ok so we have two plans of Operation on the Japanese side. What Tokyo GHQ had in mind and what the imperialist hot heads on the ground in North China had in mind. What did the imperialist group have in mind? I am thinking from things I have read the GHQ wanted a limited aquisition of rights and territiory. Re: 2 Plans for North China? asiaticus wrote: What did the imperialist group have in mind? Their thoughts were various. Some thought to occupy wide and some thought to occupy narrow. One of influential generals Itagaki wrote a letter as follows. "In North China, it is good to occupy the line of Suiyuan - Taiyuan - Shinjiazhuang - Jinan - Chingtao and establish a new North China Government." Hmm, so after the battle of Taiyuan and the landing at Tsingtao they were pretty well where they wanted to be. Apparently Chiang's refusal to make peace after the fall of Nanjing pushed them to take more extreme measures than they had first contemplated. Imperialist generals did no have any long vision toward the war. They thought that Chiang Kai-shek would sue for peace, if North China was occupied. But, he refused. Next, they occupied Nanking. But, still No. So, they occupied more. Like this, the Japanese stuck in a quagmire war.